Here’s an ancient viewgraph that I have used to tell the tale. Badly needed was better accuracy in the dating of the previous ice ages. That became available with the detection of a reversal of the Earth’s magnetic field in the seabed layers and Kukla’s terrestrial material. It was then glaringly obvious that a dormant theory about the pacing of the coming and goings of the ice was correct – namely the Milankovitch theory. According to the Serbian mathematician, Milutin Milankovitch, what matters is how much solar heat is available in summer to melt the snow that falls in winter on the large northern continents. That varies as the Earth’s axis wobbles and rolls, and as our orbit around the Sun changes its eccentricity. I explained in a lecture to the Royal Institution in London in 1980: When we were making The Weather Machine, reliable dating for the ice ages had only just become available, and preliminary tests looked very promising for Milankovitch, but the experts had not yet carried out a thoroughgoing check. There were three courses open to us. First, we could be very inhibited, and talk about the dozens of conflicting theories of the ice ages that were then current. Secondly, we could be very uninhibited and plump for the Milankovitch theory simply on the basis of a growing belief among experts that the theory was right. The third possibility was to carry out our own test, and that was what we did, albeit reluctantly, because I do not think science writers should dabble in research as a rule, any more than lobby correspondents should try to stage a coup d’etat. But if we could thereby avoid confusing or misleading our viewers it was worth while on this occasion. So I obtained the detailed astronomical calculations of the variations of sunshine and made some ludicrously simple assumptions about the freezing and melting of the ice in response to the variations. With a pocket calculator I figured out the comings and goings of the ice by simple arithmetic, and had the results accepted and published in a letter to Nature before the programme was broadcast, to make it scientifically respectable. My results are reproduced at the bottom of the rather complicated diagram from John Imbrie of Brown University and his son John Z Imbrie (see references). Note that time advances from right to left, to the present (0) and on into the future. The lowermost curve (D) is my own reckoning of the ice from half a million years ago to the present day, and on 100,000 years into the future. It purports to show the short-lived spikes of warmth, the interglacials, and also the glacial troughs. These can be compared with two actual records of the amount of ice in the world, as measured by Shackleton in deep-sea cores: Curves B and C. I had the deepest troughs, the glacial maxima, in the right places; not roughly, but pretty exactly. As this could not be a matter of chance it told us that the Milankovitch story was correct. But while the peaks of warmth are generally in the right places, the heights I obtained were often too great. The Imbries used a proper computer to generate Curve A (Authors’ model) , and the match to the ocean-core record is gradually getting better. The studies by the Imbries and myself give broadly the same forecast for the next glaciation. Those top and bottom curves, at the left-hand ends, show it proceeding by two steps into a deep ice age. Our planet came over the hump of the switchback about 6000 years ago and it is on its way down. 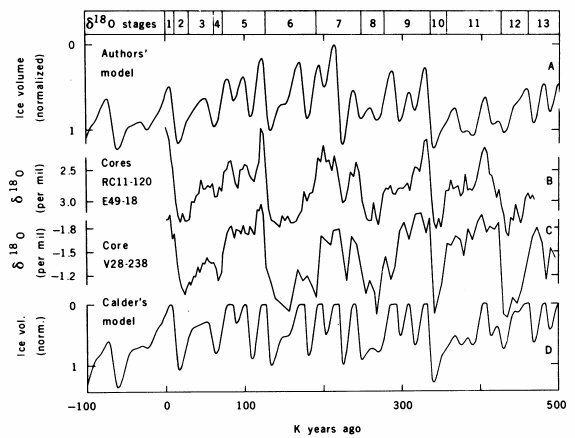 A more definitive confirmation of Milankovitch came in 1976, in a paper by Hays, Imbrie and Shackleton, using Shackleton’s data in the figure above. But long before either that paper or my own, there was widespread behind-the-scenes acceptance of Milankovitch, and Kukla, for one, was concerned about the implications. Those who rewrite the history of climate science to suit the man-made global warming hypothesis hate to be reminded that global cooling and the threat of a new ice age rang alarm bells in the 1960s and 1970s. In the Orwellian manner they try to airbrush out the distinguished experts involved, and to say it was just a scare story dreamed up by stupid reporters like me. No, we didn’t make it up. I was present in Rome in 1961 when global cooling was already the main concern at a conference of the World Meteorological Organization and Unesco (see the Unesco reference). The discussions were led by Hubert Lamb of the UK Met Office, who went on to found the Climatic Research Unit at the University of East Anglia. A persistent concern of Lamb and others was that the world might return to a Little Ice Age like that of 300 years ago. But the improving knowledge of glacial history, and especially the apparent brevity of warm interglacials, prompted anxiety about a full-blown ice age. 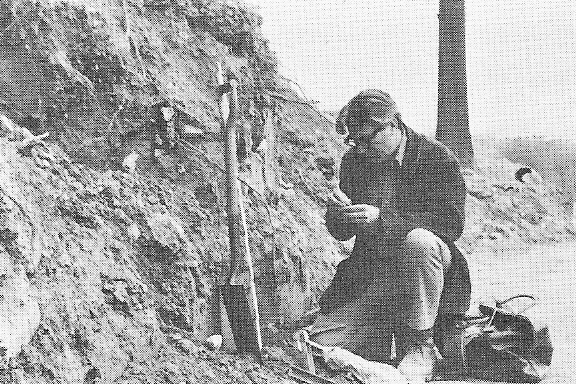 George Kukla, together with Robert Matthews of Brown University, convened a conference in 1972 entitled “The Present Interglacial: How and When will it End?”, and reported it in Science magazine. Kukla and Matthews alerted President Richard Nixon, and as a result the US Administration set up a Panel on the Present Interglacial involving the State Department and other agencies. None of us knew then that the mid-century cooling was about to be punctuated by a warming spell from the late 1970s to the mid 1990s. 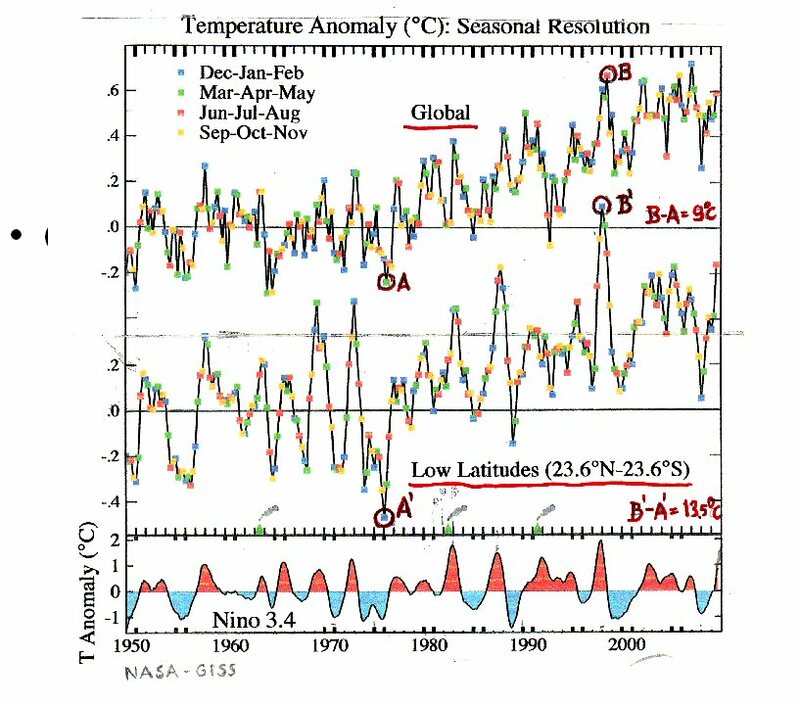 The last glacial was accompanied by the increase of areally averaged global mean surface temperature, alias global warming. … But also increasing was the temperature difference between the oceans and the poles, the basic condition of polar ice growth. 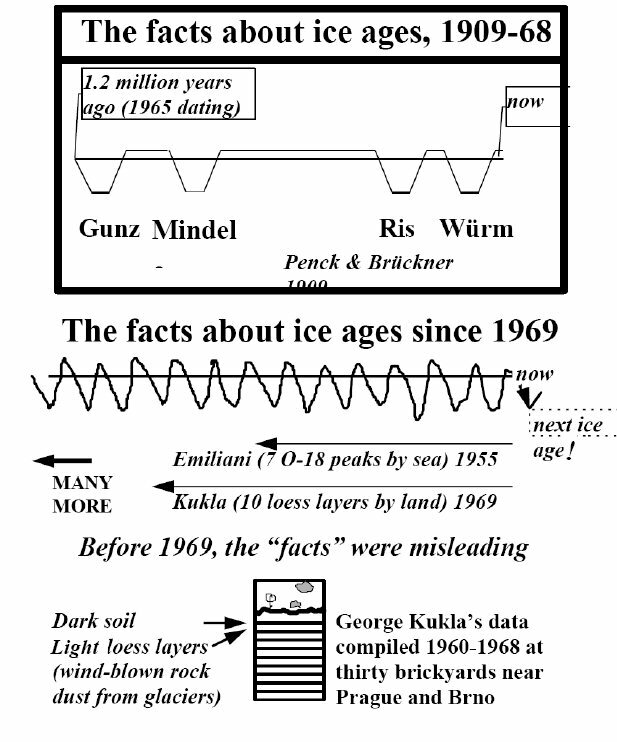 Believe it or not, the last glacial started with “global warming”! As perihelion moved from winter solstice toward spring equinox, the solar beam in astronomic winter and spring became stronger than in summer and autumn. This orbital configuration under climate conditions like today would lead to warming of tropical oceans but cooling of the polar regions. The areally weighted global mean surface temperature, which is dominated by the low latitudes, would increase. Consequently, during the first millennia, the early glacial ice build-up was most likely accompanied by global warming. It was the associated increase of meridional insolation and temperature gradients, which were instrumental in the transition to a glacial. Kukla also gave me a preview of slides for his talk in Chicago, from which I select this one. Global and tropical temperatures 1950 to August 2009. Both series, but especially the tropical temperatures, are strongly influenced by the Nino/Nina warmings and coolings of the tropical Eastern Pacific. Data from NASA-GISS. Kukla comments: Note that the 1976 to 1998 tropical warming is considerably stronger than the global one. Clearly, the tropics run the ongoing change, not the high latitudes. And the next ice age? It’s potentially comforting, that Kukla no longer seems to think that the ice age is “due now any time”. There have been further calculations of the Earth’s orbital changes, and much attention is paid to other natural processes at work in the glacial cycles, including solar variations. I’m not entirely reassured. When we made “The Weather Machine” Willi Dansgaard of Copenhagen had evidence of a very rapid downturn in temperature before the end of the last interglacial. And both Hubert Lamb of the Met Office and Nick Shackleton of Cambridge were speaking of ice-sheets growing, not by the horizontal creep of glaciers but from the bottom up across huge areas, when the winter’s snow failed to melt in summer. We called it “the snow blitz”, and I suspect that could still happen fairly soon, on a millennial timescale. Finally, Kukla tells me in an email, “I have earlier believed that man may be contributing to the warming at least a little bit, but today I am not so sure even about that.” On the policy side, Kukla met the Czech President Vaclav Klaus at Prague Castle a few years ago, and supported him in his scepticism about post-Kyoto measures to “control” climate change. “The Weather Machine”, produced/directed by Alec Nisbett, written by Nigel Calder, BBC-TV and co-producers, 1974. N. Calder, The Weather Machine, BBC Publications etc., 1974. This entry was posted on Friday, May 14th, 2010 at 11:12 and is filed under 2) PREDICTIONS REVISITED, 3a) News and Comments. You can follow any responses to this entry through the RSS 2.0 feed. You can leave a response, or trackback from your own site. Kukla’s note that the changes in orbital parameters are presently weak may not imply we have lots of time. Not read the paper yet, to find out if she says anything about the rate of onset of the glaciations, as well as their severity. Thank you for the transcript. I have limited down load from satellite so Videos are mostly out. This is along the lines I have been arguing for a while. I am in the group that thinks natural climate is only known after it happens. There are clues to future changes over time but refining our ability to predict is beyond this point in time! The AGW movement has lead science astray from real science except for a few! From what I have been reading about on this topic.It appear that we have been sliding into a new glacial epoch for the last few thousand years now. We are in the Climate Autumn part of the interglacial period.We have been experiencing progressive cooling since the 65 degree North insolation became negative about 3,000 years ago.Cooling started just before that time.Around 4,000 years. John Kehr published a book about Insolation changes and the temperature changes of the last two interglacial periods. The Emian and the Holocene. Didn’t notice the mention until today…thank you Nigel!